MOSCOW (Sputnik) - It is impossible to tolerate the situation in Syria's Idlib province indefinitely, it is necessary to separate the armed opposition from terrorists, Russian Foreign Minister Sergei Lavrov said. The Russian Foreign Minister stressed during his speech at the Moscow State Institute of International Relations (MGIMO) that "there is no place for terrorists in Syria, and the Syrian government has every right to seek their liquidation on its territory." "We are now taking the most active effort, together with our Turkish colleagues, together with the Syrian government, and with the Iranians as participants in the Astana format, to split the armed normal opposition forces from the terrorists 'on the ground,'" Lavrov said. On August 25, Russian Defense Ministry spokesman Maj. Gen. Igor Konashenkov said that terrorists of the Tahrir al-Sham group (affiliated with the Jabhat Nusra* terror organization, banned in Russia) were preparing a provocation in Syria's western Idlib province to accuse Syrian government forces of using chemical weapons against civilians. Earlier in August, the UK, the US and France said that they "will respond appropriately to any further use of chemical weapons by the Syrian regime." Russian Foreign Minister Sergei Lavrov said on Monday that he admired the ability of UK diplomatic officials to influence the European Union's and the United States' policies toward Russia over the latter's alleged role in the Salisbury poisoning incident earlier this year, given the looming Brexit. According to Lavrov, even though the United Kingdom is set to withdraw from the European Union by March 29, 2019, it has still managed to persuade some EU member states to expel Russian diplomats over the country's alleged responsibility for the poisoning attack in the UK city of Salisbury, as well as influence the United States to introduce new sanctions on Russia in connection with the incident. "I sincerely take my hat off to the UK diplomats who manage to influence the EU policy toward Russia, and the US policy as well, in a period when their country is leaving the European Union," Lavrov told students at the Moscow State Institute of International Relations. He went on to say that London had managed to "persuade two-thirds of the European Union to expel one, two, or three Russian diplomats after the United Kingdom [did the same]," despite the fact that the bloc initially demonstrated a "moderate" reaction to the Salisbury incident. When commenting on the United States' sanctions on Russia that came into force on August 27, Lavrov said that the country "had decided to run ahead of London." "I think that this showcases the UK diplomats' ability to persuade, and let those who can do the dirty work take the lead," he said. The minister went on to say that the deterioration of Russian-UK relations was a "sad story," since nothing "irreparable" had, in fact, happened. The United Kingdom has repeatedly accused Russia of being responsible for the poisoning of former Russian agent Sergei Skripal and his daughter Yulia, which took place in Salisbury on March 4. While Russia has denied these allegations, saying that the UK side failed to provide sufficient proof, London has repeatedly called on its partners to step up pressure on Russia. From the United States, this came in the form of sanctions. Moscow will not leave the US sanctions imposed in connection to the poisoning of Russian former double agent Sergei Skripal and his daughter Yulia in the United Kingdom unanswered, but the response would not be necessarily a mirror one, Russian Foreign Minister Sergei Lavrov stated. "Of course, we will not leave this without response, it will be announced. This will not be necessarily a mirror response. I believe that a mirror response is not always the optimal option," Lavrov said. The minister stressed that the latest US sanctions were introduced against Russia based on "absolutely false allegations." On August 8, the US administration announced new sanctions against Russia, consisting of two packages, over its alleged use of chemical weapons in the poisoning of Russian former double agent Sergei Skripal and his daughter Yulia in the UK city of Salisbury in March. The first package of sanctions, which in particular, includes a ban on deliveries of dual-purpose electronic devices and components to Russia, took effect on August 27. Russia does not accept the illegitimate steps taken by the United States on a number of issues, including the Iranian problem, the World Trade Organization (WTO), the Israeli-Palestinian settlement, Russian Foreign Minister Sergei Lavrov stated. According to Russian Foreign Minister Sergei Lavrov, Washington is taking "simple, direct" actions which have little to do with diplomacy. "We do not accept the illegitimate steps taken by Washington, that, I would like to repeat once again, undermine many important achievements, including in the Iranian problem that had been settled through an unprecedented document, the questioning of the need to be a member of the World Trade Organization, let alone the US stance on the Palestinian-Israeli settlement," Lavrov said. According to Lavrov, US President Donald Trump and US Secretary of State Mike Pompeo understood that better relations with Russia were in the US interest. "Personal contacts are of significant importance. I was present at the meeting between [Russian] President [Vladimir] Putin with President Trump, I held talks with Secretaries of States [Rex] Tillerson and Pompeo. Those are people who, in my opinion, understand the need to get along with us in the interest of the United States, as they say themselves," Lavrov told students of the Moscow State Institute of International Relations (MGIMO). The United States is willing to use the language of blackmail and ultimatums in international relations instead of diplomacy and dialogue, Russian Foreign Minister Sergei Lavrov noted. "There is a group of countries, a small group, led by the United States, which does not want a dialogue. It wants to use the language of dictate, ultimatums, blackmail instead of diplomacy. We see this everyday," Lavrov said while addressing students at the Moscow State Institute of International Relations. Lavrov recalled that Washington was "revising everything," starting from the Joint Comprehensive Plan of Action (JCPOA) and the Paris climate agreement, and ending with its stance on the World Trade Organization, which it was calling an outdated organization. 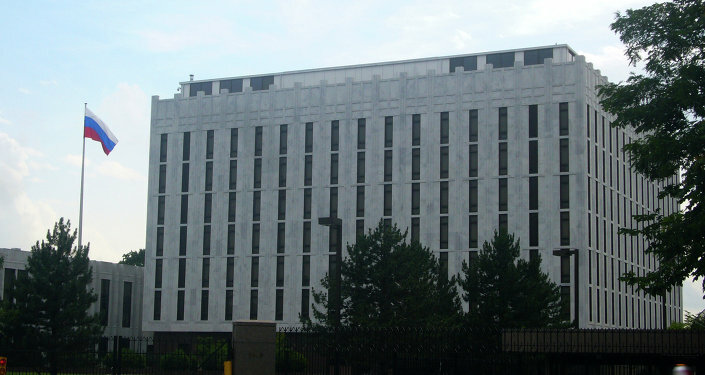 Each US administration has been committed to the principle of "America First," but the current government under President Donald Trump was adhering to it in the "most rigid and aggressive" way, Lavrov said, adding that everyone who refused to obey the will of the United States fell victim to sanctions, ultimatums and threats. "In Washington, it has become a sort of bad form to speak positively about normalizing relations with Russia," the minister said recalling that US Sen. Rand Paul was "ostracized" in the United States after his recent visit to Russia. Lavrov also said that Moscow was open for dialogue, despite Washington's ongoing policy of sanctions and restrictions. According to media reports, the second round of sanctions, expected to roll out in November, may include scaling back diplomatic relations between the two countries, suspending flights of Russian airline Aeroflot to the United States and almost completely ceasing US exports. According to the US State Department, Russia could avoid these measures by assuring it will never use chemical weapons in the future. The European Union is starting to understand the importance of Eurasian integration in order to remain competitive, Russian Foreign Minister Sergei Lavrov stated. "We, in the Eurasian Economic Union [EAEU] and in the Shanghai Cooperation Organisation [SCO], rely on [what's going on in] reality, we try to promote the projects that virtually ask to be implemented today. Thus, we ramp up a potential for further integration by taking practical steps that all the participants have agreed on… We favor the idea of these processes involving the EAEU, SCO and ASEAN [Association of Southeast Asian Nations] member states, and we are constantly emphasizing our readiness to hold the doors open for the European Union," Lavrov told students. The minister added that "voices" were being raised in the European Union claiming that it would be difficult for the bloc to remain competitive in the modern world, given the "increasingly stiff" and sometimes even "unfair" competition. Russia is a member of the EAEU and SCO alliances, which aim to promote intergovernmental cooperation among Eurasian states. While the SCO is cooperating closely with the ASEAN on a number of issues, the EAEU also seeks to deepen trade relations with East Asia.